For players searching for an alternative to regular slot and table games, yet still want to stick to tried and tested brands, Playtech has just the solution for you. The world-class online casino games provider has come out with a new bingo variant of its phenomenal Age of the Gods series. The group already debuted two bingo games based on the action-packed slots series at the beginning of the year, and the new 90 ball bingo variant promises to be just as fun. It’s time to head to online casinos where you can find the newly launched Age of the Gods Multiplayer Bingo room to enjoy the latest arrival. Here you will find enhanced in-game animations for an excellent gaming experience, as well as the chance to win big in the new Age of the Gods: Athena vs Ares bingo game. Playtech has already added its first two bingo titles, namely Lord of Lightning and King of the Underworld to the Age of the Gods Bingo Room. 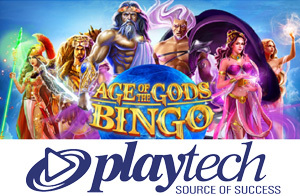 The managing director of digital bingo at Playtech, Angus Nisbet noted that Age of the Gods has been a huge success and has driven exceptional growth for Playech and its partners. Bringing the brand to bingo, therefore, was a natural next step. “The development team has done a fantastic job in recreating the look and feel of the series in the new Bingo room, and I’m confident players will love features such as the Golden Coins bonus,” he added. According to the Playtech executive, the first two bingo games in the Age of the Gods series have already proved to be very popular with bingo slots players. At the end of the bingo game, a 3 x 3 grid of Golden Coins makes an appearance of the screen and can be viewed by all players. The Full House winner turns the coins to reveal a God, and when three icons are matched, payouts are made – either to the winner or to the multiplayer community.